We wanted to shine a spotlight today on the lovely Melissa Lunden. We have been working with Melissa for a while now, and she recently completed another beautiful quilt for us for Quilt Market, using our Circa 52 fabrics. I am an avid sewer living in Central California with a very handsome husband, adorable two-year old, and five sewing machines. If I am not thinking about sewing, I am probably thinking about cooking, baking, what book to read next, or which park to go to after Lila wakes up from her nap. 2. Who introduced you to sewing and when? My mother is the one who started all of this. She is an amazing sewer who patiently let me use her machine as a child. Luckily it was a Singer from the 1960’s so it could take a beating. 3. Why do you have such a passion for sewing now? My passion for sewing is so multifaceted. I love working with beautiful fabric; I love the challenge and sense of accomplishment after finishing a project; I love the connection I have with other sewers; and I find a deep joy in giving handmade gifts. 4. And, what is your favorite sewing project…and why? I made my first quilt four years ago and my love for quilting just keeps growing. I was inspired by all of my friends having babies. Nothing makes me happier than seeing a sweet little baby lying on one of my quilts. Thank you! The bags were what started it all. 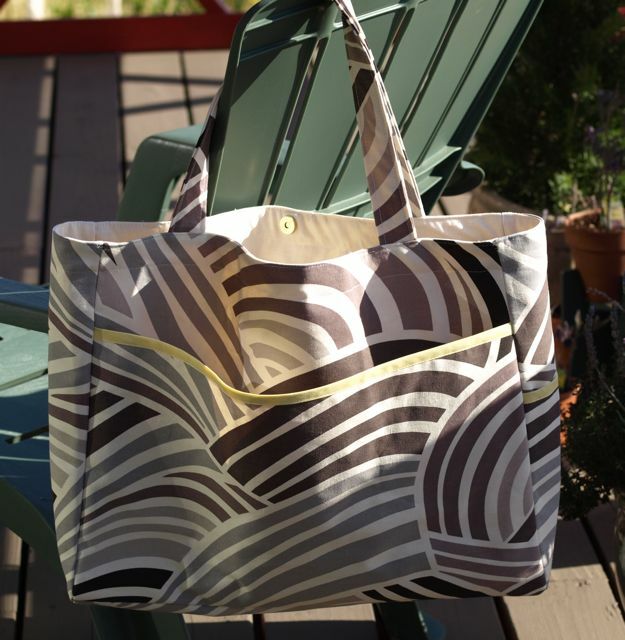 I took a bag making class years ago in San Francisco at Stitch, a sewing studio, and it was magic. I loved pairing fabrics together to make something that every lady needs. The next thing I knew, people wanted to buy the bags from me, and who was I to say no? Selling the bags meant that I could buy more beautiful fabrics so I could make more bags. 5. 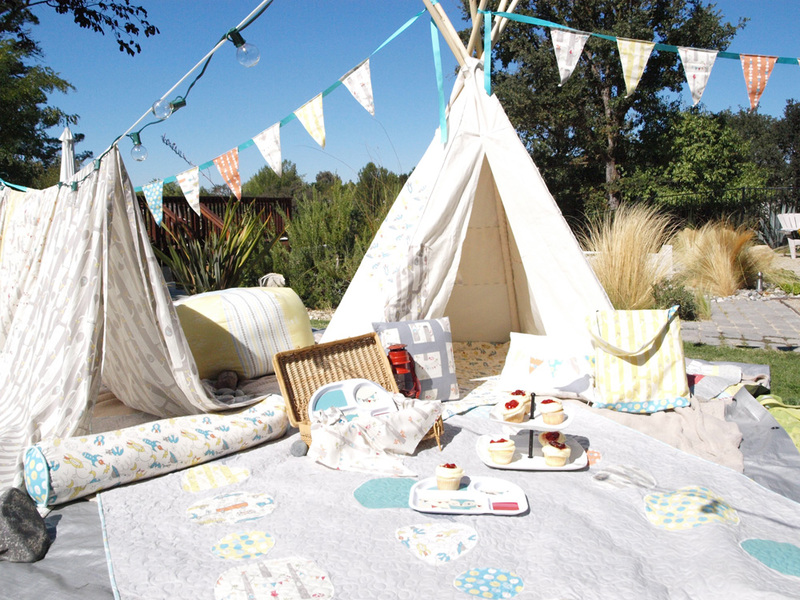 Please tell us about your inspiration for the Circa 52 Pebble quilt. 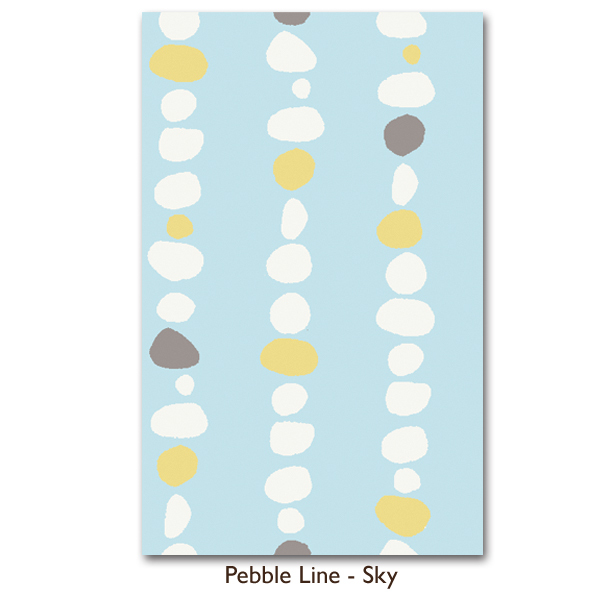 The inspiration for the quilt came from the design of the Pebble print in the Circa 52 line, which was Cynthia Mann’s idea. I wish I could take credit for it, but the genius is all Cynthia. It is such a fun way to show off the prints and to play around with different sewing techniques. This quilt was the first time I created something that was predominately applique, rather than piecing. It was a fun challenge. I used five different pebble templates to use with the prints. The pebbles are appliqued onto the Kona Ash with fusible web and then the edges of the pebbles are secured with a tight zigzag stitch. Favorite color? Aqua. It is such a great pop of color and pairs so well with everything. If you could be someone other than yourself who would it be? It would be me, just with a much fancier long arm quilting machine. What actress would play you in a movie about your life? Drew Barrymore. Favorite food? A crusty baguette and some good cheese. Favorite Movie? Most recently it is Man on Wire. I am an attorney that is licensed to practice in California and New York.